We be closed on Saturday, July 4th in honor of Independence Day. We will resume our regular hours at 10:00 a.m. on Monday, July 6th. 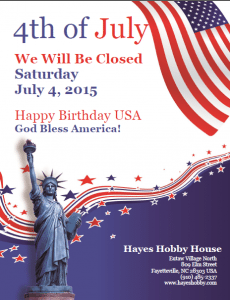 All of us at Hayes Hobby House wish you a happy and safe holiday on the coming 4th of July!